I write on behalf of the Santa Ana Police Officers’ Association, its Board of Directors and Political Action Committee. We are aware many friends can be called a “homie” and people do identify themselves as living in or being from the “hood”. These words alone should not produce a negative opinion of another person. 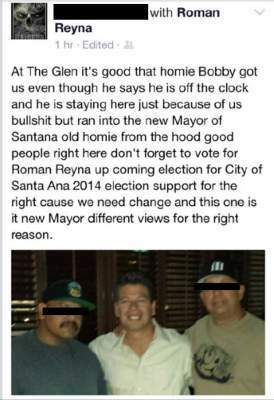 However, when coupled with a photograph of known members of a Santa Ana criminal enterprise, and posted on an Internet social media website, we feel that far exceeds mere poor judgment. As a city policymaker, this photograph and comments presents the appearance and perception of your lack of ability to be a trustworthy and effective community leader. 1607 N. Sycamore, Santa Ana, CA 92701.